Taking place at Green Dermatology & Cosmetic Center. 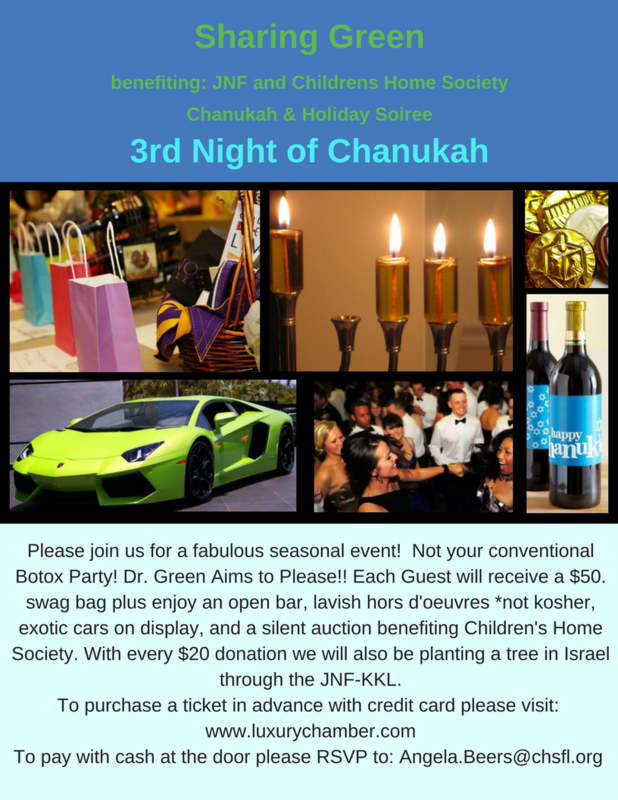 Sharing Green is the first Chanukah Party in the history of South Florida to incorporate one Jewish and one Gentile charity and donate 50% to each. This years soiree boasts Childrens Home Society and JNF as the charity benefactors. Please help us raise funds for these great causes. Celebrating a festival of light in South Florida? We hope that you do it respectfully and drive safely. While most Jewish drivers are safe and cordial on the highway there is always someone out there who needs more driver education. As for the Holy Season - Chanukah is actually one of the most important Jewish Holidays as it commorates commitment and with that we would have nothing!!! Happy Hanukah 2017 on behalf of Luxury Chamber and member!! !